Up to 8 via IPX/LAN, modem/serial. My interest in this game began whilst flicking through a paper games mag (gasp! ), and coming across its advertisement. The piece featured on the inside front cover was quite eye-catching; a double-page spread, black background, in the centre is a birdseye view of a man sitting in a bathtub. Turn the page and witness the bathtub completely full of thick, dark, red blood. "BLOOD... SPILL SOME" states the caption. If anyone else remembers seeing this ad, do you also recall thinking, "I WANT THIS GAME... NOW NOW NOW!" And admirably, afterwards, I did give a thought to the tasteless, vile and crude method of advertising. Didn't stop me wanting the game, of course. 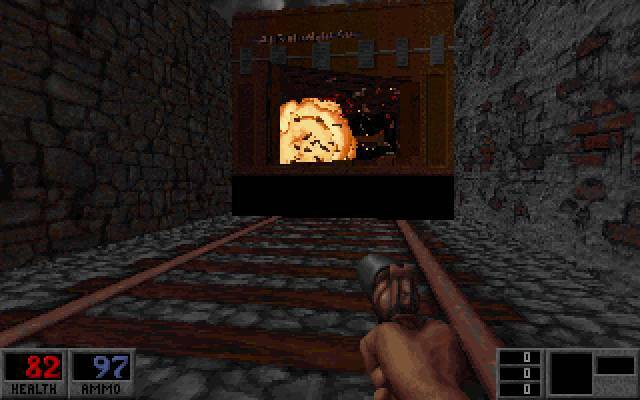 Blood is a 3D action game, which 3D Realms (creators of the heavily critically-acclaimed Doom-beater, Duke 3D) began developing through a contract with QStudios. Late last year, Monolith Productions bought QStudios, so they took over completing the Blood project. The theme for this game is actually one that hasn't been used in the 3D action market yet - the undead. The little blurb text included with this shareware version tells a short story of an evil God that betrayed you, and cast you back to Earth in 'mortal flesh'. So you take on the role of some cloaked avenger, looking to be accepted back into the 'Hall of Epiphany', and face the God who has banished you once again. What can I say but: RATS! You know you're in for an exciting ride, once you begin your first game, and discover you're in a grave. The headstone slides open above you, as you retch out in a raspy voice, "I live... again!" A pitchfork as your only weapon, you now have to jump out of your grave, and begin a journey to find the God Tchernobog, fighting your way through his undead minions. The shareware version offers you an entire episode, consisting of about 9 levels, and a good helping of all the weapons and monsters that feature in the full version. The graphics become immediately recognisable as something 3D Realms would do - no dark, brooding, colorless Quake levels here. A lot of the scenary is once again interactive, allowing you to pop switches, play with objects that furnish the rooms, and skewer dead bodies that lie all around the area into bloody pulps. Humor, too, is very much present; an example of which is when you stand by a sink, hit the SPACEBAR, and hear, "out, out, damned spot!" You get to use six of the twelve imaginative weapons in this shareware version, including the Flare Gun, Sawn-off Shotgun, 'Tommy' Machine Gun, Dynamite Bundles and the Incinerator. These really are wonderfully cool weapons! When firing the Flare Gun at a nearby Zombie, you get to witness it penetrating their skin (the impact knocking them to ground), then seconds later watching them leap up and run around in flames as the Flare pellet inside them ignites! Gruesome! Selecting the Dynamite prompts our protagonist to hold up a bundle of the danger sticks in his right hand, while his left lifts a Zippo lighter, lights it, and then holds it close to the wick, while you run around, ready to blow the explosives. You can then choose to either have it lit and explode on impact, or have it run it's 5-10 second course before blasting everything in the nearby area. It's great when you're killed with lit dynamite in your hand - the weapon still goes off, blowing your already crippled body into more pieces! Alright, one at a time people, don't crowd! There's plenty for everyone! The creatures in Blood start out tough, and just get tougher. Woooo boy, yes. Even on the easiest setting, the first creature you come across, the Zombie, refuses to be killed even after you've knocked him to the ground twice. Fortunately, once you poke his head off with your pitchfork, you know he won't be getting up again. For extra satisfaction, you can also kick his spewing decapitated skull around for a while, if you want! The next monster to thwart your quest is the "Cultist". These cloaked human soldiers of Tchernobog are amazingly accurate shots with their shotguns; too good, in fact, they've usually plugged you with 3 or 4 deadly shells before you've had a chance to see them! To make matters worse, they can also lob dynamite bundles at you! Rats frequent the early levels too, nipping at your ankles, with incredibly high health-draining bites. As you can see, the difficulty of this game is really quite high. Factors like crackshot enemies and far from surplus ammo spread throughout the levels really makes this journey a long and dangerous one. 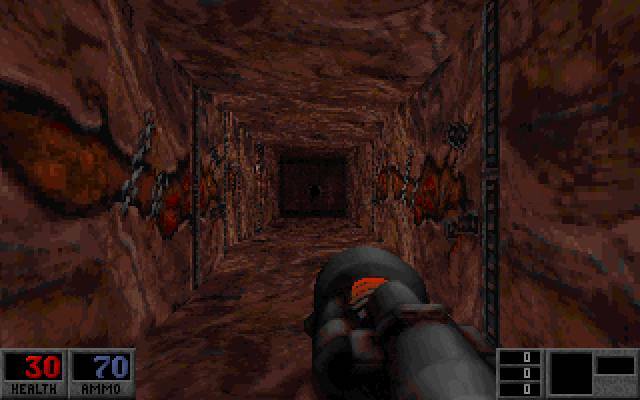 The fast-paced, all-out action of games like Duke and Doom are not present with single-player Blood. This is a title where caution and sneak attacks help survival much better than running in with blasting guns. Hell, I don't claim to be a great 3D action gamer, but I've certainly been playing examples of this genre for a long while now (ever since they first began, in fact), and I can't get past the first few screens on the later levels, even when I use the in-built cheat codes (kindly provided by Monolith on their Blood Web Site) to give me all weapons! Whether this is due to a badly designed difficulty or me just being an 'old-timer' where these games are concerned, I'm really not sure. (left) Get up, get UP, damn you! Now, my experience of multiplayer is limited, but from what I've played, it looks to be great. The first level is nicely designed for 2 players or more to go hunting around, it's got lots of walls that can be blown through, giving you many access points in each room, to either ambush or escape from your foe. Weapons are scattered about, with much more generosity than single-player offers, that's for sure. This side of the game, without a doubt, holds a lot more fast and frantic action. Well, we have 3D action games coming out of our ears right now (not forgetting that the majority of them seem to have been released out of bodily parts less pleasant than our ears before reaching us), so what's Blood's rating amongst them? While it's true it really doesn't technically-speaking add much new to the genre, this shouldn't be a reason for holding it back; after all, we should be glad things are still being released without the need for hi-tech video cards and that damn MMX chip. (right) [chuckle] Don't you just hate mimes? Blood has a good theme, is professionally designed, requires thought and skill, has an excellent multiplayer mode, features new and exciting weapons, and best of all, you get to try out an entire episode free, thanks to id Software setting that wonderful trend of releasing 3D actions into the shareware market. The full version, to be sold retail through GT Interactive, will comprise of 4 episodes (34 levels) with many extra monsters and weapons (listed in the accompanying .txt file), and will probably be priced around $39.95. The theme is new, but the gameplay is old - not that that's a problem! Single player levels are tough - this might serve to frustrate, rather than increase game's longevity. Multiplayer is as action-packed as ever. Shareware version includes .TXT file to explain game functions and features. Full version being sold Retail. None found, but patch for 0.99b recently released to solve certain bugs. Copyright © Richard Green for the Games Domain Review, 1997 . All rights reserved. Not to be reproduced without permission.